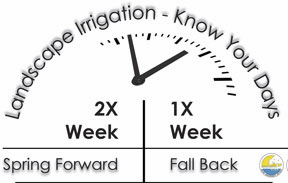 LIVE OAK, FL, Oct. 31, 2018 – The Suwannee River Water Management District (District) is reminding district residents to shift landscape watering to once per week beginning November 4, 2018. The fall watering schedule will remain in effect until March 10, 2019. Cooler temperatures and shorter days call for less watering in the winter due to slower growth and less evaporation. Irrigation schedules seek to ensure efficient water use and conserve water resources. Additionally, November is historically the driest month of the year which works in perfect tandem with the slower growing season, lunar changes and cooler temperatures. Non-residential properties are permitted to water on Tuesdays. Business and residents are encouraged to use Florida-Friendly Landscape principles and skip watering when it rains close to a scheduled irrigation day. Agricultural and other large irrigation uses maintain year-round guidelines through the District’s water use permitting program. For more information about landscape irrigation measures or to learn more about the District, visit www.mysuwanneeriver.com or follow us on Facebook and Twitter, search @SRWMD.